“I had glass doors in my last house wrecked by my dogs. Not only were they covered in scratches they also always looked filthy. The dogs eventfully died of old age, we moved houses, and when we got a new puppy called Misty I started searching for ideas to prevent the scratched mess on the glass from our new puppy. While searching online I came across the Pebble Smart Doggie Doorbell and decided to try it. It works perfectly. People seem amazed that a dog can do this, and the first question I am asked is how hard is it to train them to use. We found the treat pouch worked brilliantly. We had a short issue over a couple of days when she figured it out and kept ringing for attention/treats, but we got over that really quickly by opening the door and making her go out each time she rang (we only did this once she had mastered the physical ringing of the bell). She quickly realised ringing the outside bell once again opened the door and got her back in. We didn’t have to show her or teach her to use the outside bell (as it is identical to the inside one). Misty doesn’t jump on the glass at all. If she is impatient she just re-rings the bell. Sometimes I forget I’ve let her out, and she could be sitting outside waiting to get in unknown to me, so that doesn’t happen now as I can hear the bell anywhere in the house. She mastered toilet training the same week she mastered the bell (up to then she would pee on the mat at the door occasionally). The bell has pretty much put control of the door in her hands so we aren’t having any toilet accidents in the house now either. I’m really pleased with this product, and for this reason wanted to take the time to write a review for you, and provide you with a video of Misty using the doorbell so other dog-owners can see what a great product this is! “Just a note to tell you how great a product you have. Our two year old Rottie Maijaa was doing a nasty job of pawing our entry door in an effort to get in the house. 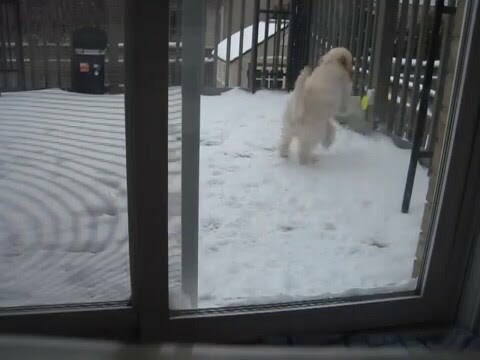 We ordered your “Doggie Doorbell” and in a few weeks she was using it to let us know she wanted in. Since then we obtained a boxer puppy who learned to use the bell in just three days. Cant tell you how grateful we are with your product. We wholeheartedly want to thank you for providing a real working product. Oh the door is much happier now also. Thanks Again!! “Just to let you know how happy we are with our new Pebble Smart Doggie Doorbell. We have a new labrador puppy and we introduced the doorbell to her when she was only 10 weeks old. It took her less than 3 minutes to learn how to ring the bell. She’s now almost 12 weeks old and already uses the doorbell (at least sometimes!! :))) when she needs to go out. We always ask her to ring the bell before we open the door to go out with her to go potty (and always does) so I´m very confident that in a couple of weeks she’ll get fully house trained with the help of the your doggie doorbell. “Myrtle, my Miniature Schnauzer, always scratched at the kitchen door when she wanted to come in from the garden. So I purchased your Doggie Doorbell from your UK supplier last year in the hope it would stop this. I spent over a month trying to teach her to use it without success and had just about given up hope that she would learn to use the doorbell. Then suddenly last November she rang the doorbell and has been doing this ever since. Even when we’ve been away on holiday for a week she still remembers to ring the doorbell when we get back. We are thrilled with our door bell! Our dog, Tukka, figured it out so quickly. It has cut down on her barking significantly! Much more pleasing to the ear as she is in and out frequently throughout the day. Thank you so much!